Q) Where does the child go at the age of 10 after he/she completes the Montessori curriculum at Little Scholars? At around 10 years after the child completes the Montessori curriculum, he is well prepared to go to 5th class in any school. Q) Which system of education does Little Scholars follow? Little Scholars is an Authorised Montessori Pre school, wherein we follow the pedagogy and methodology formulated by Dr.Maria Montessori. The Montessori system of education is a 100 year old system, followed world wide in thousands of school. Q) Is Little Scholars is a play school? Little Scholars in NOT a play school. Little Scholars is a pre-school, where in all the basic developments of the child are catered to. The child is introduced to all academic concepts which he will require to further his knowledge once he moves out at 10 years. At 10 he/she will be fully prepared academically and socially to take to any school. Q) What is Little Scholars Montessori House of Children? Little Scholars is a Montessori school, which caters to the age group of 2 – 10 years. We have two different environments which are as follows 1.Primary Montessori: 2 - 6 years. 2. Elementary Montessori: 6 - 10 years. Q) Do young children need to be toilet-trained? Our school has no diaper-changing facilities. We believe that a child of 2yrs should be toilet trained for his own comfort. Our support staff have help the child if this has not been taken care at home. Q) My child is not in a Montessori program and I want to change to Montessori. What can I expect? The younger children below the age group of 3 can be changed to the Montessori environment provided they have not been exposed to the alphabets in succession i.e. a, b, c, d…, We have found that older children generally have a little difficulty where language sounds are concerned as they tend to get a bit confused .Again it depends on individual child and the parent. Montessori program can be best described as a shift for most children from a teacher-dominated situation to a child-centered classroom. There can be direct admissions for Elementary classroom at the age of 6yrs if the parent is interested to admit his/her child into the Montessori Method of Education. Q) What is the size of a Montessori class? 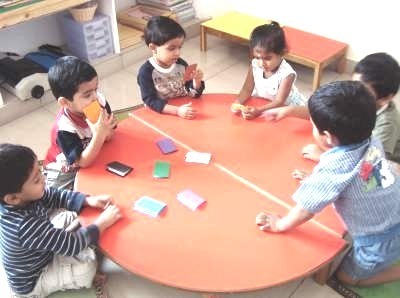 A Montessori environment caters to a maximum of 35 children from mixed age group with 2 adults to supervisors. Q) What is your school's policy on religion? Little Scholars Montessori is officially a non-sectarian institution. Our classrooms contain information about the major religions of the world as part of Montessori's cultural curriculum. All faiths and belief systems are respected, and children are welcome to share traditions and observe religious holidays as they choose. Q) My child is particularly bright. What can you offer her? Because Montessori philosophy is child-centered, your child may explore as thoroughly and rapidly as she is interested. It is not unusual in a Montessori environment to have 4 year-olds begin reading using phonetic materials or begin addition with math materials. Likewise, children who are not yet interested in the particular reading or math materials may focus on other work like geography that is getting to know continents and culture of different countries or learn about plant life from botany until they are ready. The needs of both highly capable and less advanced children are met by Montessori methods at primary level. At the Elementary level the Montessori Curriculum further enhances their reasoning mind, imagination, intellectual curiosity, and creativity.